Make 2017 your year of spiritual connection. Feeling cut off, alone, and isolated? Want to start feeling connected? for you to reach out and connect. A powerful, inspiring, transformative mini-series that will change the way you live your life. RGH is not scheduled at this time. the WISDOM of your Divine Self! Are you feeling confused, lost, on your own, and unsupported? When you've asked for spiritual guidance in the past, did you receive answers that didn't quite make sense to you? Have you been wanting to live from higher guidance, to know that each step of the way your Divine Self is available, supporting you, and walking your path with you? Did you think that 5-D was supposed to be easier than 3-D, only to discover that you still have many challenges before you? 3rd Dimensional being to a 5th Dimensional being. You have UNLIMITED potential to access DIVINE WISDOM, DIVINE INSPIRATION, and DIVINE GUIDANCE directly. LEARN the 8 secrets of Psychic Receptivity. 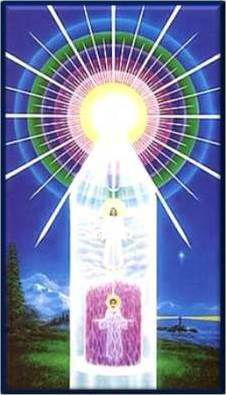 INCREASE your receptivity to Divine Messages. ALIGN with your soul path. Restore your direct communication with the Divine. Participate in exercises to help you connect with your I Am Presence and personal guides. Learn techniques to open and strengthen your communications. Have actual conversations with your I Am Presence and other guides. Journal what you receive to create a record of your progress. Receive valuable messages you can refer back to in your daily life. Share your experiences with others in the class. Build your confidence in your own Divinity. during the meditations and exercises. <<--- INVEST in your Self. Only $197 for the series. you'll be shown how to join the class mailing list to register. "I never realized it was so easy to receive and trust in higher guidance. Nedda makes it easy so that messages come without even asking sometimes." "I just loved the class. It provided me with a clear and simple tool box for receiving higher guidance. Now, I'm less afraid of talking to my I Am, of getting no answer. Now the answers I get are clearer and more specific. This class gave me support and encouraged me to practice, which is the key to learning.